Founded almost a century ago as a company specializing in the production of gears for airships and heavy vehicles, ZF now is in the top ten automotive suppliers in the world. With more than 120 factories in 27 countries producing specialized transmission systems for passenger and commercial vehicles and a comprehensive range of steering, axle and chassis components for major car manufacturers, ZF has any vehicle mobility needs covered. 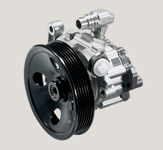 With a strong annual investment in research and development of new technology, ZF is leading the industry in the push for smaller, more efficient and reliable drive systems with it's successful 6 and 8 speed autos, and the revolutionary new 9 speed transmission for compact front-drive vehicles, while at the same time supporting a long history of partnerships with automotive manufacturers with its "ZF Tradition" service, to keep the classics running strong. 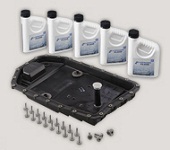 ZF offers service and replacement parts for all areas of your transmission, from genuine internal components to the factory specified fluids, repair kits or complete units, the ZF transmission product range covers it all. Covering almost 1,000 lines, products in the ZF steering parts program are all manufactured to the high specifications of original equipment, ensuring the best fit and performance.